Shortly speaking, the new added Smart Backup option since version 7.0 can create an intelligent schedule to monitor specified files or folders every half an hour, and create a new backup image file if there is any changes made in the past 30 minutes. Files and folders on network location cannot be protected with this option. It cannot use to backup partition and disk. Smart Backup is especially useful when you have some frequently changed database files, or a shared folder updated by all internal users. it can help you creates multiple backup points every day and allow you recover to any of them or even roll-back to past days. If this question concerns you, you have to learn the difference between full, incremental and differential before reading the next paragraph. The first image of Smart Backup will be always Full, and every 7 days, there will be a new full image created at the beginning of the day. All other days will start with an differential image file. The rest image files on every valid day will be incremental backups. If the computer powers off or becomes malfunction, then it will be seen as an invalid day and no image files is going to be created on that day. 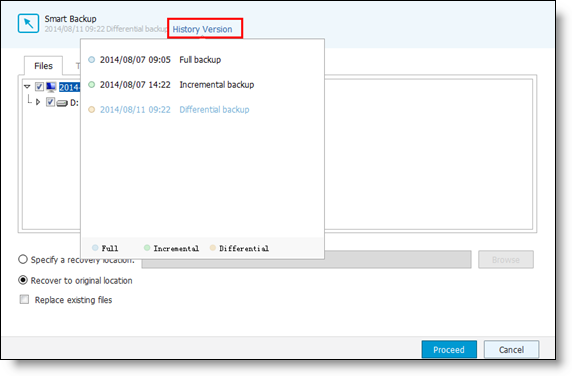 To avoid filling up the destination space, Smart Backup deletes old image files with the following rules. 1. After the first backup of the next day created, all the incremental image files built on previous day will be removed. 2. There will be 6 differential image files at most. That means the first differential image file will be deleted after the 7th one created. 3. There will be 2 full image files at most. 1. All backup points created on the same day. 2. The initial status (first backup of a day) on past 14 days at most. The recovery always gives the latest backup point for you to recovery. If you need to recover to one of the previous point, the figure below shows where to select History Version for recovery.